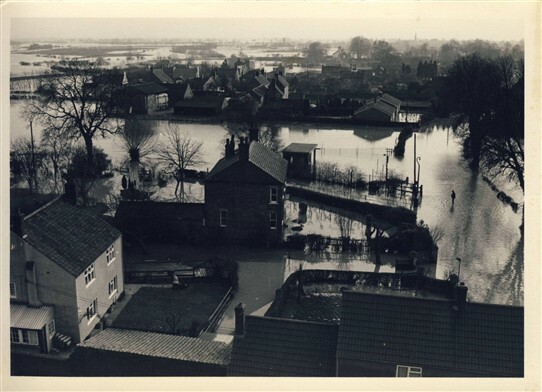 Attached to this article are two pictures depicting the floods that occurred in 1977, in Sutton-on-Trent. Both pictures were taken in February 1977. 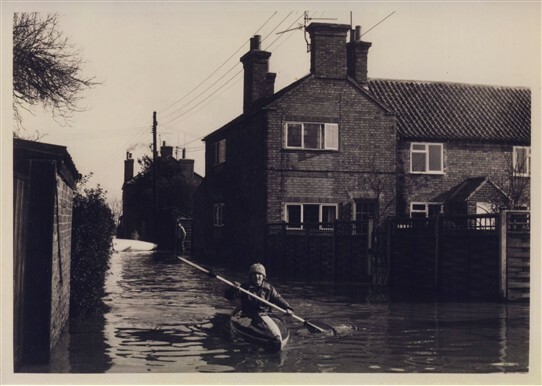 The view of the boy (Neil Rogers) kayaking was taken in Middle Holme Lane (running off Main Street). He regularly had to go onto the Holmes to feed some chickens that had been marooned there! Incidentally, the building just shown on the left hand side of the photo. borders my property (where I moved to in 1981). The second photograph is a view up Main Street from the roof of the Church. Also taken in February 1977. The man standing on the right is roughly in the centre of the road. The flat-topped building in the centre of the picture is the bus shelter. The stretch of water extending in front of it is John Marshall’s field that hosts the Sutton festival each year. I know that flooding was widespread in that year, in our region, but as I was abroad at the time, I have no in-depth knowledge of this. However, I am reliably informed, that it was widespread. As the recently flooding in the south and west of England has been a topical subject, I thought these might provoke some interest and comment. So please comment! And add more pictures please! This page was added by Jill Campbell, Nalhs Newark on 18/03/2014.